I may have mentioned that we live in a small town in the middle of Texas, 90 miles north of Houston, 90 miles south of Waco, and 100 miles east of Austin. Between us and anywhere, in every direction, are smaller towns about every ten miles, ranging in population from 200 to 10,000. For comparison, the Bryan/College Station area includes a population of about 150,000. Plus or minus the 49,000 students at A&M, I'm never sure if they are counted in that number. This is the story of one of those small towns, and how it has captured my imagination. Just out of town, ten miles west of the airport, lies Snook, population 569. Or at least it was when this sign was printed. We are in a census year, so that number is bound to change shortly. Recently the Captain read in the local paper that Snook is having a bit of a political problem at the moment. You see, no candidate has stepped forward to run for the office of mayor in the November election. That's right, nobody wants to be mayor of Snook! Upon reading this, we were greatly entertained. The news birthed a fantasy in our minds, that this could be our golden opportunity to enter the world of politics and make a difference! This fantasy would make more sense had either of us ever previously considered political involvement in anything. But there is no arguing with Fantasy, because her cousin Reality Check lives at the far end of the galaxy. So the idea was planted. Since the day of the news article, whenever we hear the word, Snook, someone has felt obligated to follow with the phrase, Mayor of Snook. Semi-concurrently, we returned from vacation with dreams of moving back out to the country. 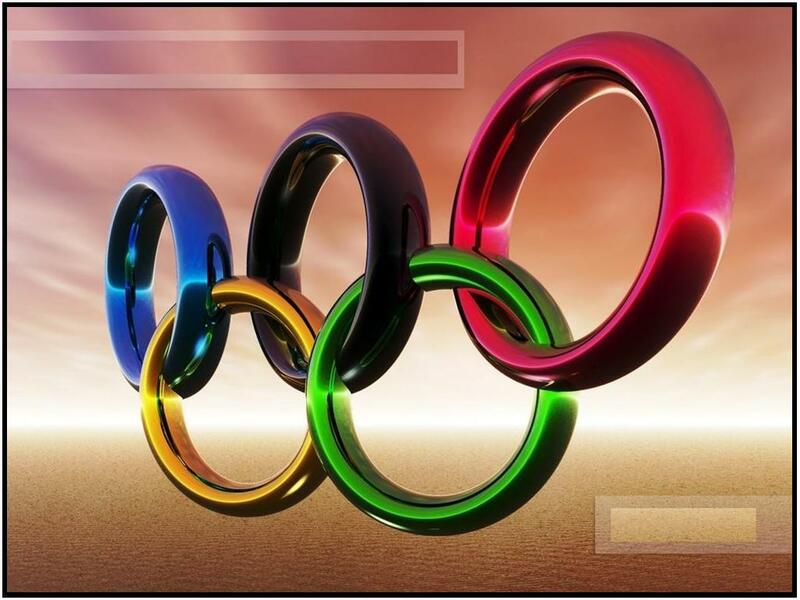 After all, what would an Olympic year be without us talking about moving? Relax, we are not moving. We are simply perpetual dreamers, and this is our current fantasy trip. We want land, lots of it. And everything within ten miles of town is out of our price range. So this weekend we took our fantasy to the next level and started driving the countryside to check out some currently available land. Can you guess what direction we chose to check out first? I hope you guessed Snook, because the only thing better than buying yourself a kingdom would be to get one in a town where you could also exert influence on the neighboring kingdoms! I learned two things about Snook this weekend as we drove through its 2-block "downtown" at least seventeen times trying to locate several properties. One, this is the home of Slovacek sausage. That's the local brand everyone's always raving about, and for good reason. Lots of flavor, lots of varieties. Yeah! Two, uh, I already forgot the other thing I learned about Snook. Hmm. Maybe it will come back to me. I also learned just now on a Google search that a "snook" is a kind of sport fish. But that's neither here nor there. What did entertain me greatly was Boo's insistence, all day long, of repeating "Mayor of Snook" every time the word "Snook" came up in conversation. Which was about 100 times. Entertaining because her voice and my inner monologue are starting to sound eerily alike. But I was discussing our pursuit of land. 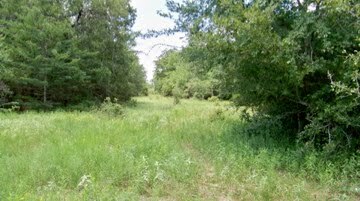 The first three properties we saw in Snook were of the pasture variety. Nice, affordable, but not inspiring. The fourth, however, was a little piece of fairy magic. After several wrong turns and a torturous trip down a mile of county road in dire need of repair, we turned onto a private road. Another half mile of gravel lane, under the canopy of mature trees and vines, to the chorus of cicadas and crickets, and we reached a trio of gates. The cattle-guard-protected gate to the right stood open next to a realtor sign, beckoning us to turn down the overgrown path ahead of us and explore this 30 acre wooded lot. 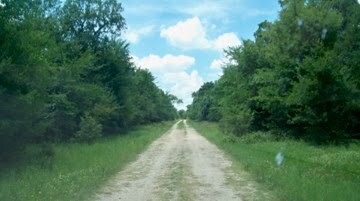 Something about roads trailing off into the distance compels me forward every time. As we drove forward, feeling ourselves lulled into another world, my eyes caught a flicker of movement through the trees in front of us. Soon we came upon a marvelous trio: a white-spotted donkey and a pair of chestnut (bay? roan? 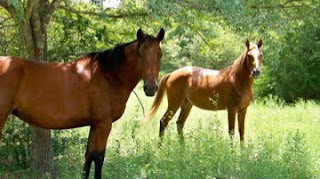 I have no idea) horses, standing not ten feet from the path. With N O T H I N G separating us from them. Whoa. I suddenly felt like a safari participant. The pure magic of finding ourselves so close to these amazing creatures caused me to fall head over heels for the dream of owning land. Almost to the point of coveting or obsessing. But so far it's just fantasy, a fun way to pass the time and build castles in the air. Upon leaving the property, a little hushed and impressed by the power of the woods, we found ourselves jolted back to reality by the terrible road back to the rural highway that led to the road back to Snook, and the seemingly endless 20 miles back east to town and south to Red Boot. What good would this retreat be if we found ourselves bounced and impatient every time we left the property? Also, we were unable to locate a grocery store in Snook, save the Snook Food Mart in the gas station. I'm pretty sure that Snookers (Snookites? Snookies?) drive back to my relative metropolis for their major shopping needs. I may be mostly awesome in many ways, but being organized enough to live 15 miles from my local HEB? Honestly, after a lifetime of living with a mile of the store, I am still adjusting to my current 5 mile commute. So, all that said, I don't think we will be moving to Snook anytime soon. The property was magic, but not enough to draw us out there in the foreseeable future. My political aspirations have been laid to rest. It's a nice town and all, and they do have great sausage and even a Mexican restaurant. Unfortunately, it's just too far from home base to be a realistic dream. 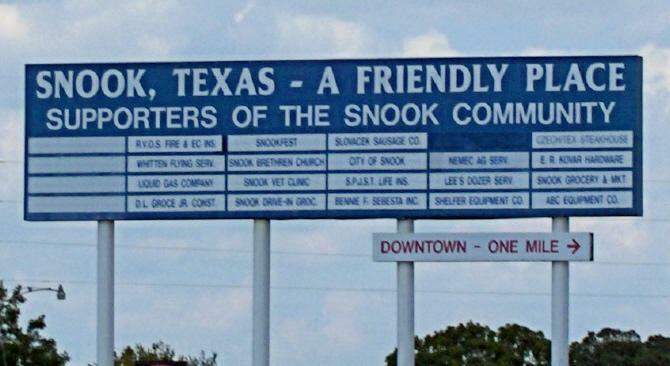 But I'm pretty sure every time I hear someone mention Snook, I will still feel obligated to chime in, "You know, you could be the Mayor of Snook!"